Cobra is an organization of bad guys against which team Joe must constantly battle. And as long as they have weapons like this fierce-looking helicopter, it should be quite a battle indeed. 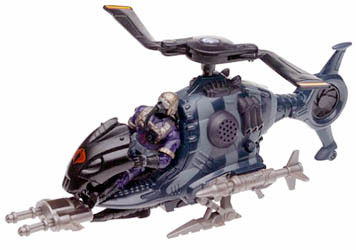 The Cobra Fang vehicle features spring-loaded missiles that fire and posable guns. Attach the included rocket and hit a button to hear battle sounds or check out the chopping sound made by the rotor blades. A Cobra soldier is included with the set.